While we celebrated India’s birthday (our country has completed 64 years of Independence), the culinary world was celebrating the birthday of one of the most famous personalities where food is concerned- Julia Child. She is the most prominent figure in revolutionizing America’s culinary scene, bridging the gap between the home kitchen and the professional one. For Mrs. Child, mistakes were not the end of the world, just part of the game. I guess even the big boom in food blogging can be attributed to Julia Child and the admiration that one person had for Julia Child’s cookbook. Julie Powell’s Salon blog may be the first cook-through blog. And of course, the movie itself introduced a lot of people to the food blogging world. We have a lot to thank Julia Child for. Mostly, gratitude is due for the inspiration she gave to us home cooks to follow our passion and not to give up on something we are passionate about. Julia Child began learning to cook when she was thirty-seven years old. That in itself should be a testimony to the fact : It’s never too late to follow your dreams! Coming now to this week’s Garam Masala Tuesdays. 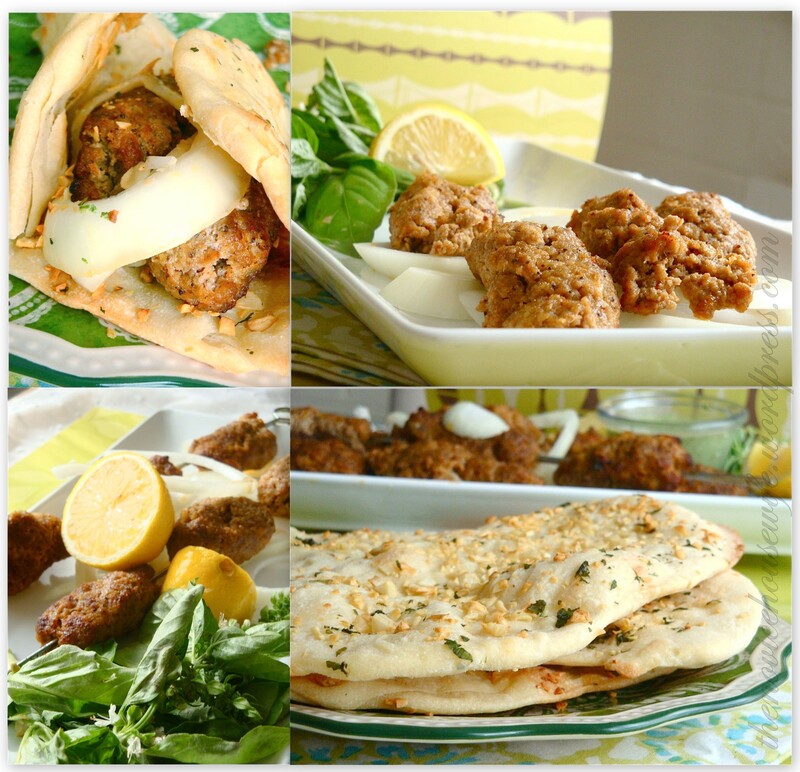 I have two recipes for you and of course, the winner of my first Blogiversary Giveaway ! Firstly, I want to thank everyone who wished me, continues to read me and also a big thanks is extended to those who left their feedback as to what they liked on the blog and what they would like to see more of. All suggestions are duly noted and I’ll try my best to implement them. Mr. Random.Org chose comment no. 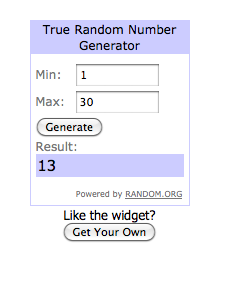 13 as the winner (though it says 32 comments on my post- one was mine and the other was a pingback, so I did not count that and numbered the comments accordingly, hope that was fair!) . Anyway that means Louis, I will be sending Sarabeth’s Bakery Cookbook to you! Congratulations! Leigh from Luv n Spoonsfuls mentioned in her comment that she would like to see more basic Indian dishes that are universally acclaimed. 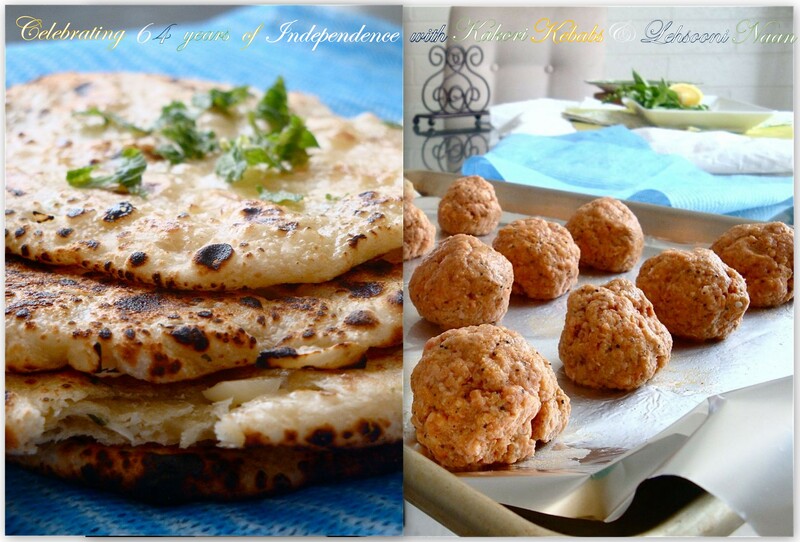 Keeping that in consideration, it was only befitting to celebrate Independence day and this week’s GMT with kebabs and naans– both popular Indian dishes in Indian restaurants everywhere. And though the method seems times consuming at first glance, it is pretty easy and straightforward to achieve results in both the recipes. As I mentioned in my last post, India has always welcomed foreigners absorbing their ideas and cultures in their day to day living. Thanks to this character, we have been blessed with a beautiful culture and an amazing range of cuisine. Out of all those who ruled over India, the Mughals probably left the biggest mark on Indian food, especially seen in the food of the Northern region of the country. History, tradition, and religion have encouraged North Indian cooks to experiment with lamb dishes. Because of their Muslim backgrounds, Mughal kitchens could not use pork. The use of beef was also actively discouraged in a predominantly Hindu country. And, neither geography nor habit permitted the ready inclusion of fish or seafood in the diet. Although Mughlai cuisine came to include some excellent chicken dishes, they never compared in quality or scope with the supreme Mughlai culinary achievement, the inspired cooking of lamb. It was mandatory that the animal be slaughtered by cutting the jugular vein with a sharpened knife and while uttering the name of Allah. The meat produced from this type of slaughter, that is, by bleeding the animal to death, was called halal meat. 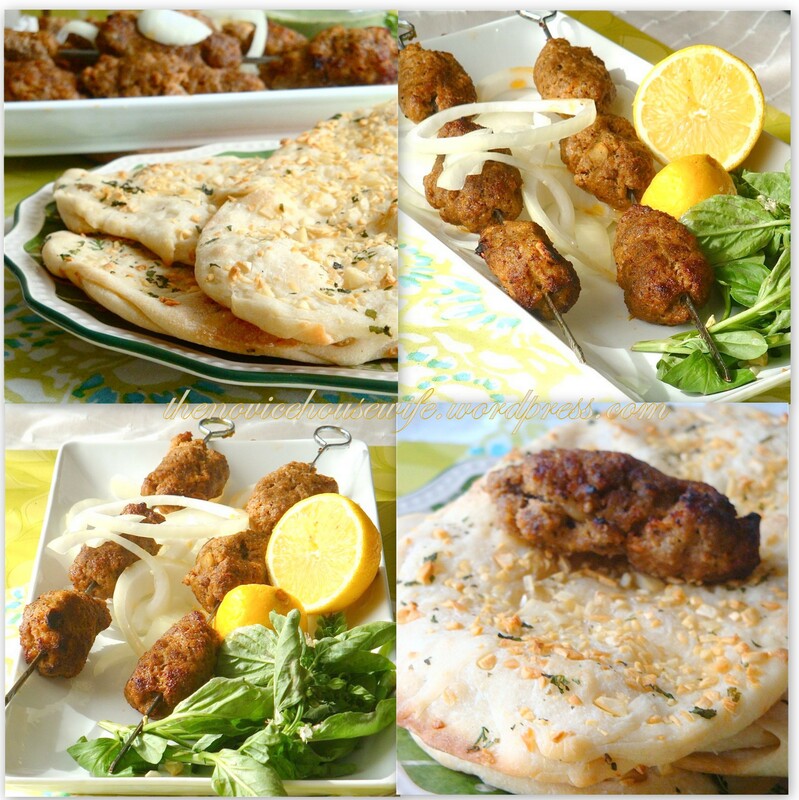 The seekh kebab has long been considered a piece de resistance in the Mughlai kitchen. The beautifully executed kebab is what every Lucknawi is proud of. 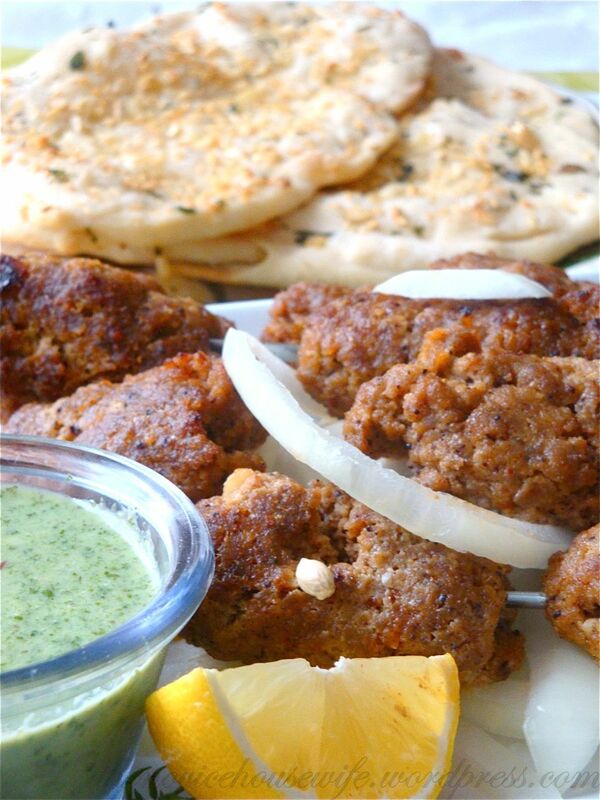 The seekh kabab, introduced in this region by the Mughals, as mentioned above, was originally prepared from beef mince on skewers and cooked on charcoal fire. But later influences and innovations led to the use of lamb mince, which was preferred for its soft texture. The immense popularity of this kebab led to further refinements and improvements and one cook from Kakori found much acclaim for his efforts in this direction. Kakori is a small village town on the outskirts of Lucknow, the capital city of the Indian state Uttar Pradesh. During the freedom struggle, it became well known for the famous ‘Kakori Case’ when a band of freedom fighters looted the train carrying the British Government Treasury money at this obscure place. In the same period, of British rule, it was also customary in this region for the rich Rajas and Nawabs, to entertain senior British Officers and ply them with the best hospitality they could offer. And if it was the mango season , a ‘mango dinner’ was very much in order (dinner in a mango orchard, was followed by a variety of chilled mangoes served in great style). At one such parties in Kakori, stung by the remark of a British Officer regarding the coarse texture of Seekh Kabab, the host, Nawab Syed Mohammad Haider Kazmi summoned his cooks the very next day and asked them to evolve a more refined variety of the Seekh Kebab. Ten days of incessant research and design efforts resulted in the now famous ‘Kakori Kebabs’ which was as far as perfection could go. The mince for the kebab was to be obtained from no other part but the ‘Raan ki Machhli’ (Tendon of the leg of mutton) and Rawaz or animal fat was replaced by khoya, black pepper replaced by white pepper and a brand new mix of powdered spices which still remains a closely guarded secret added to the perfect blend. And of course, the Nawab invited the same officer again and presented the new version of the Seekh Kebab and needless to say it met with great applause. Since then the Seekh Kebabs of Kakori became famous by word of mouth and even today, though cooked elsewhere, are known as ‘Kakori Kebabs’. Of course, where famous dishes are concerned there is always more than one theory of origin. There are claims that the origin of these soft and delicate kebabs actually revolve around the toothless Nawab (king) of Kakori. He was old and toothless (some versions say he lost his teeth in a freak accident). He craved to eat meat, yet because of his condition he could not. The royal chefs were then called upon to make something especially for the king. After a lot of brainstorming, the kakori kebab came about. Either ways, thank god for the whims and fancies of the aristocrats/rulers that reigned over India. Thanks to them, we are able to enjoy the goodness of melt in your mouth kebabs! Another thing that the Mughals brought to indian cuisine was their flatbread Naan. 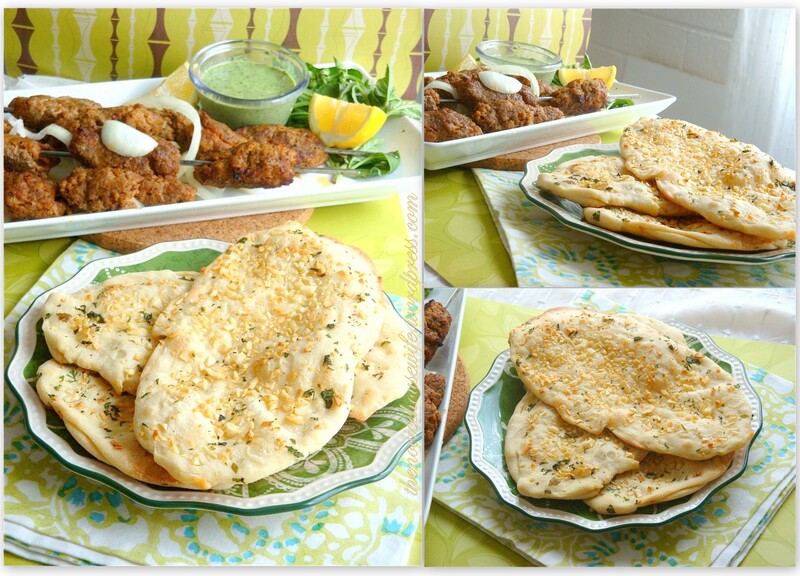 Naan is a flatbread that is a staple food in Southeast and Central Asia. It is especially common in India, Pakistan, Afghanistan, Iran, Uzbekistan, and surrounding regions. Because naan is popular in so many countries, it has a number of different spellings and pronunciations. 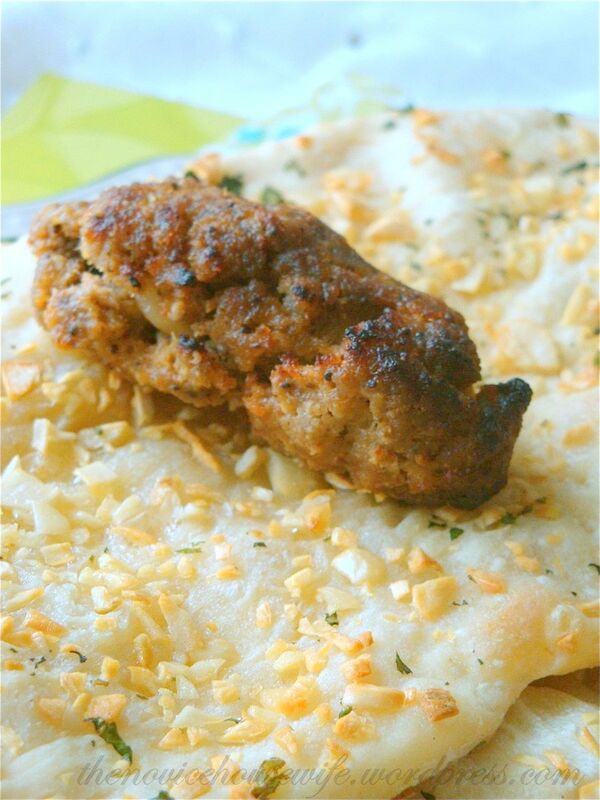 In Turkic languages such as Uzbek and Uyghur, for example, naan is known as nan. In Burma, the bread is called nan bya. The Burmese variation is slightly softer and resembles pita bread more than other types of naan. 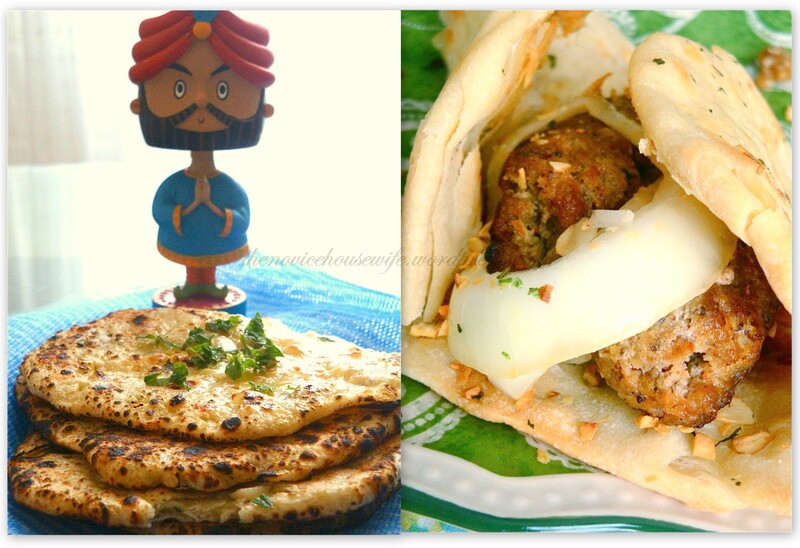 A favorite breakfast for common Muslims was naan accompanied by kheema (minced meat) or kebabs. And that’s what we will be replicating today. Of course, I can not fathom having this for breakfast. The food is rich, perfect for lunch or dinner. With leftover naan and kebabs you can make rolls. Slather a little mayo, mint chutney and ketchup on the naan. Put the kebabs and top with some onions and make a roll. You can keep it together by putting a toothpick in the center. They are delish! You can also make Naan Pizza. You can make this an even more complete meal by adding some dal makhani to the menu. And finishing it all off with some Mango Kulfi. Now that is a Nawabi (king size) meal! You can make naan with yeast as well, but I wanted to give a non-yeast recipe so that people who are scared of working with yeast too can have a go at this recipe. This is also the way my mom makes. I will post about a yeast based naan recipe too soon and will point the differences. If served immediately and not rolled out too thin this naan recipe will yield a nice, chewy but soft naan. And with all that garlic (hence the name “lehsooni” which means garlicky) incorporated a really tasty one too! While I prefer the stove top method (it’s more convenient and quick plus you get the charred look), feel free to use whatever suits you! If you have a tandoor nothing like it! Put the egg, baking powder, sugar, baking soda, yogurt and milk into a bowl and whisk together. Sift the flour and salt into a large bowl. Make a depression in the center of the flour, add the egg mixture and start mixing gradually, adding in enough water to make a soft dough. When fully mixed, knead the dough on a lightly floured work surface for 5 minutes. Transfer to a baking tray and cover with damp cloth and set aside for 10 minutes. Add the oil to the dough, then knead and punch down the dough, cover with a damp cloth and let rest for 2 hours in a warm place. When ready to make, if using the oven, preheat oven to 400 F. Put an oiled baking tray in the oven to heat it. If you have a pizza stone, that would work as well. In case using the stove top method. Heat a tawa/skillet on medium heat. Divide the dough into 8 equal portions, roll into balls and place on a floured work surface. Flatten the balls slightly, then spread about 1 tbsp chopped garlic and 1 tsp of the mint-cilantro mix. Set aside for 5 minutes. Lightly oil the palms of your hands. Flatten each ball between the palms of your hands to make a round, tucking in the garlic and mint-cilantro. Stretch it into an elongated oval shape. Make sure that you do not stretch it too much as you do not want it too thin else when you bake it, it will become too crisp wherever its thin. You want the naan to be soft. To cook, if using the oven, place on the pre-heated oven tray and bake for 10 minutes. If you want it lightly charred, set the oven to broil and cook till the top starts getting charred spots, for about 30 seconds to a minute. If using the tawa/skillet, put the naan on the hot tawa and cook for 30 seconds on each side. Then remove the tawa and cook both sides of the Naan over direct flame of the gas burner with tongs. The Naan will puff up a little, and some spots will get charred (which imparts the lovely smoky flavor). Remove from heat and brush it generously with melted butter or ghee. Serve hot. It has been said that meat for the kebab is minced and ground a minimum of 13 times to get the texture that makes it to melt completely with just a bite. Initially I wanted to make galouti kebabs another melt in your mouth kebab, but I had no raw papaya which is a key ingredient in making those kebabs. In fact many recipes I saw online call for raw papaya in kakori kebab as well. Some use kidney fat to tenderize the meat. But I am using the recipe Pushpesh pant gives in his book India: Cookbook ( I love this book!). 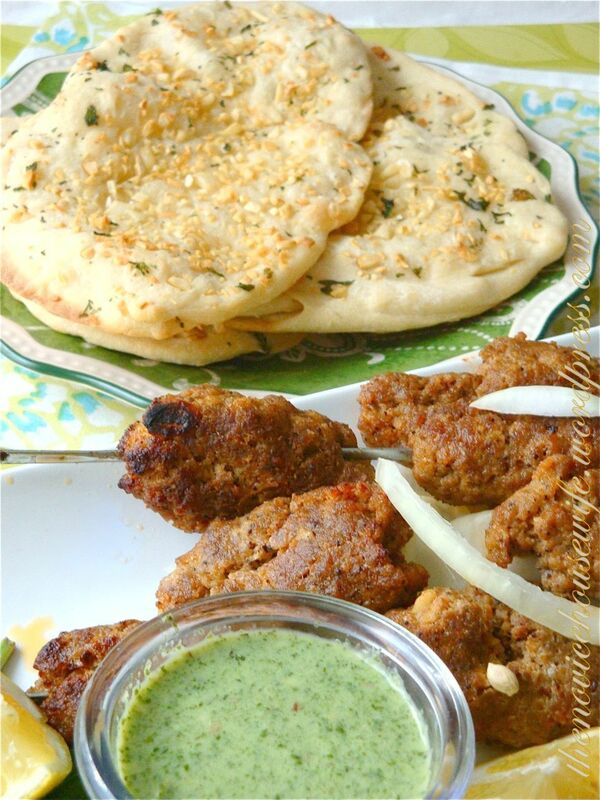 Serve with mint chutney and some onions these kebabs can be served as appetizers as well! For the cashew and poppy seed paste. Soak both separately in water for 30 minutes. Drain each. Grind each with a little water to make a smooth paste. If not using immediately, store in the refrigerator for up to 24 hours. Preheat the grill ( broiler) to moderate heat. Grind the minced lamb again to make sure its properly ground. Mix in the spices, pastes and grind once more. Season with salt and grind again. You could do it 13 times but I just did it thrice. Divide the mixture into 16 equal portions and roll into balls. Thread the balls on to several metal skewers and, with damp hands, flatten then into a long sausage shape. Cook in the broiler for about 5-8 minutes, turning frequently to ensure even roasting. Baste with melted butter and cook for another 1-2 minutes, or until cooked. Serve hot with onion slices and mint chutney. Or eat with naan. I’m happy to be the winner of your first giveaway! I emailed you my home address. Love your blog – your recipes look great! I tried making naan only once so far .. success it was but for some reason it’s not happening often. You just inspired me 🙂 This is fantastic treat for celebration! 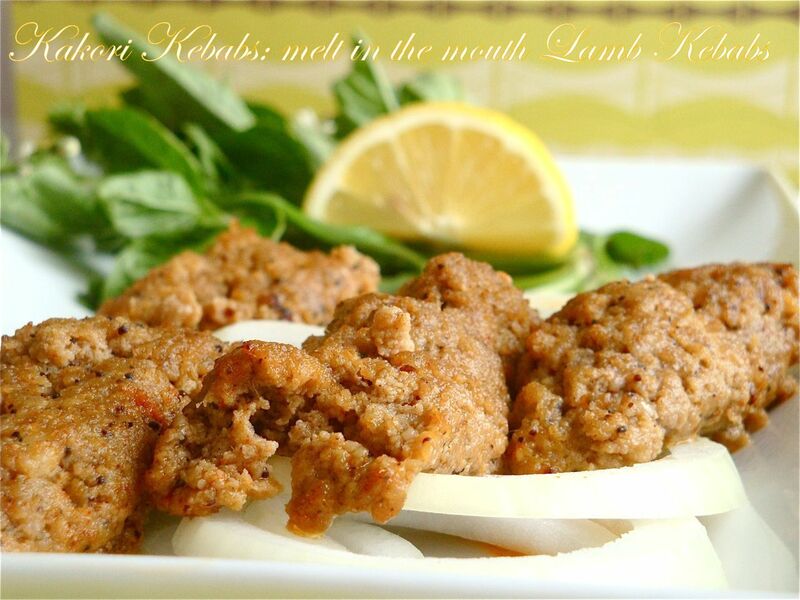 The flavors in the kebab look amazing as do your pictures. Is there something special to making the cashew and poppy seed paste? Oops sorry! I had to add that part but forgot. Thanks for reminding me! There’s actually nothing special. You need to soak both in water for 30 minutes and then drain and grind it with some water. Will just update that part! Hi Deepa! Thanks for the suggestions. I did try my best to explain it. I had planned to photograph the steps but forgot to take photos while doing them. Will take some the next time I make and put them up soon. As for the video, I am very camera shy, so it will take time for me to start putting up videos! But in case you need any clarification do mail me and I’ll try my best to help you out! Just happened to see your blog… Great photos! Amazing food! Will definitely try the recipe some time! What a winning combination. I have had kakori ke kebabs pretty often from Lucknow and you have me craving some now. Did you miss the kachcha papeeta in the texture. I have some frozen for times like this. I grind a small green papaya and freeze it as ice cubes. Must try your recipe. Both look FAB! Wow! That looks like a FEAST! The food looks yummy 🙂 And Yes , a video will really help. Can I make the Naan without adding the egg ? Well, maybe I have to look into making a video then! Probably get my husband V do it and that ways I can stand behind the camera! It will actually be a good test of my instructions because if he can do it, anyone can! About the egg, I think it should be ok if you leave it out, just increase the amount of yogurt by about 3 tbsp. Great ! Thanks 🙂 I will try it without the egg and let you know. Am also gonna try the lotus root curry this weekend. What a beautiful post, in every way. The food looks delicious (the photos are so nice) and I love the recipe history that you provide…so interesting. 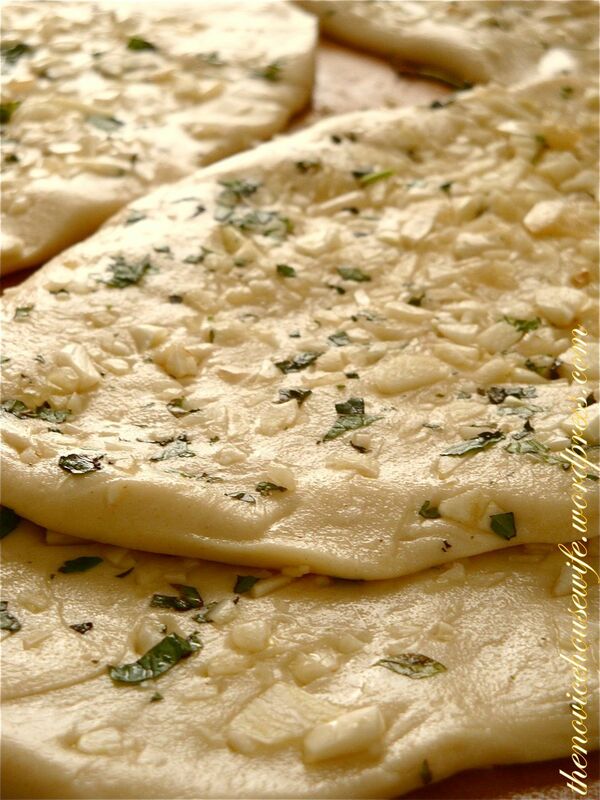 You naan looks so divine, I wish I could have some as this is my favorite kind, with lots of garlic! Bookmarking this for sure, and eagerly await your yeast naan recipe!